In the past 16 months, I’ve read 168 books, and I can count on one hand those that hooked me as quickly and thoroughly, relentlessly chained my interest–nay, obsession–to it’s roller coaster plot, and–having had its way with me–spat me out by way of a lovely ending. 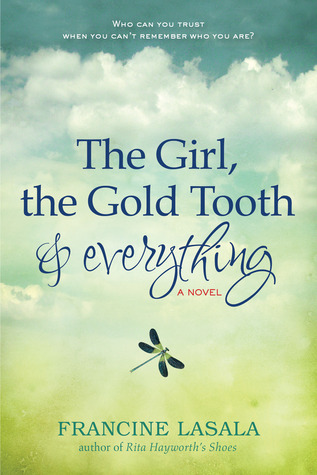 “The Girl, The Gold Tooth, And Everything: A Novel” is an amazing ride, and a tough book to describe. Mina is a young wife and mother living in an odd gated community. Her husband, Jack, is a salesman, and he travels a lot. Mina’s daughter, Emma, is maybe three, and she’s feisty and willful. The problem, though, is that Mina doesn’t remember getting married. She doesn’t remember being pregnant. Her only real friend is a kind, elderly neighbor, who watches Emma when Mina needs to go out, and who provides a shoulder to cry on when things get too bad. There are bill collectors hounding her, and Mina becomes overwhelmed. Sometimes, something random will spark a memory fragment inside her. She can’t remember her past, but she gets glimpses. As the book progresses, these sparks add up. Mina discovers parts of her “real” personality that have lain dormant for years. In dreams, she encounters memories, but they’re wispy and ephemeral. Eventually, Mina starts to make new friends. Some of them will help save her life. Others will try to destroy her. I could not stop reading this book. At work, I read between clients, till finally, I could get home and just read. Author Francine LaSala writes beautifully, but her truest gift is knowing how to release Mina’s memories in dribs and drabs. We as readers become as obsessed with getting Mina’s memory back as Mina does. We feel invested, because her character doesn’t know more than we do. When she meets new people, so do we, and we make our judgments whether they’re good or bad, same as Mina. And ye gods, this book could have gone wrong. If the story had been handled any less skillfully, the entire framework of the book could have collapsed. Thank the Book Gods, Ms LaSala deftly avoided these pitfalls. The result is one of those books where we’re so drawn into the story, that it seems to read itself. All we can do is hold on and enjoy the ride. This entry was posted in Best Books of the Year, Books, Literary or Genre Fiction, Mysteries/Thrillers and tagged Francine LaSala, The Girl The Gold Tooth and Everything: A Novel. Bookmark the permalink.